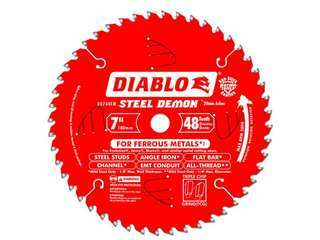 Diablo blades are designed to fit Evolution, Trajan, Jancy, Morse, and Similar Metal Cutting Saws. 7-Inch/18mm diameter x 48t, 2mm arbor, 39+ RPM, 1/8-Inch max cut thickness, general purpose steel. 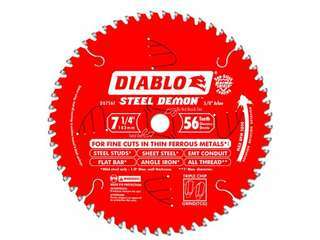 Diablo's blade is designed to fit 7-1/4-Inch Circular Saws. 7-1/4 -Inch diameter x 56t, 5/8 -Inch arbor, 56+ RPM, 1/8-Inch thin steel max cut thickness, mild steel. 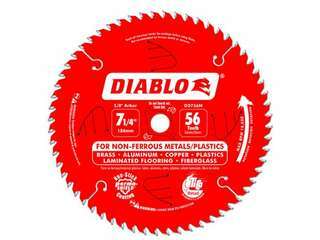 Diablo's specialty Non-Ferrous/Plastics thin kerf blade has a Triple Chip Grind (TCG) Tooth Design for long life and a clean, burr-free finish. Diablo blades are ideal for on-the-job cutting of nonferrous metal such as copper pipe, aluminum extrusions, brass plate and other soft metals. 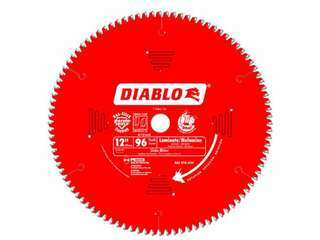 Diablo's blade is designed to fit 7-1/4-Inch Circular Saws. 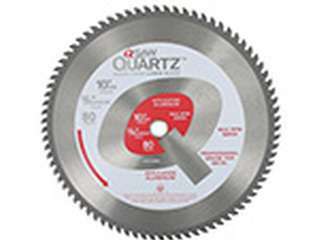 7-1/4-Inch diameter, 70T, 5/8-Inch arbor, 56+ RPM, 18 gauge or thinner steel max cut thickness, very thin steel. 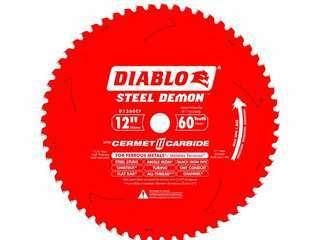 Diablo’s new Steel Demon 8 Inch 42 Tooth Cermet circular saw blades deliver 3x the life of a standard carbide-tipped blade in metal cutting applications. This blade features new, exclusive innovation with a special Triple Chip grind and Perma-SHIELD coating to provide maximum cutting life in a wide variety of ferrous metals. Ideal for 8 inch low RPM metal cutting saws. This Blade uses CERMET teeth instead of Carbide. Diablo's blade features a thin kerf triple chip design that is specially designed to cut laminate flooring, double-sided laminates and melamine cleanly, leaving a smooth finish with no chipping or tear-out. Laminated materials are highly abrasive, so these blades feature a TiCo™ carbide blend ideally suited to harsh service. 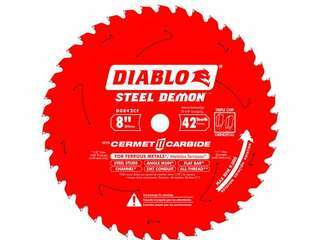 Diablo's blade is ideal for 12 inch sliding miter saws and portable table saws. 12-inch diameter, 96t TCG, 1-inch arbor, 5 degree hook. 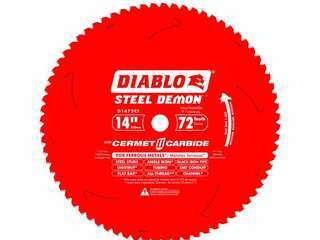 Diablo’s new Steel Demon Cermet circular saw blades deliver 3x the life of a standard carbide-tipped blade in metal cutting applications. Ideal for cutting metal under 1/8" in thickness. 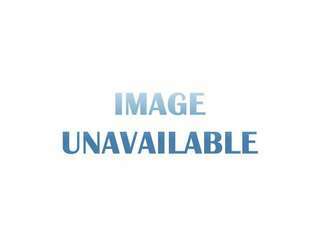 Material applications include: sheet metal, metal roofing, and electrical conduit. 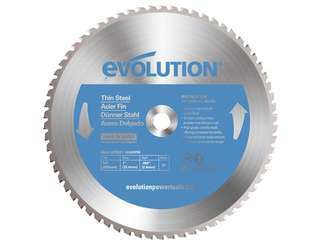 Evolution Saw Blades are designed for accuracy and precision and to deliver maximum performance by using the highest grade carbide, hardened blade bodies and ultra high grade brazing techniques. When cutting metals, Evolution Blades leave an instantly workable finish and produce virtually no heat, burrs or sparks. 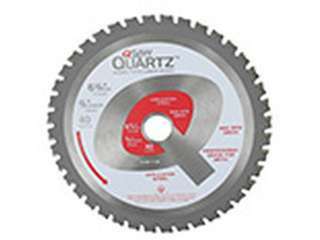 Ideal For: Cutting Thick Non-Ferrous Materials And Aluminum. Wall thickness 1/4" Max. 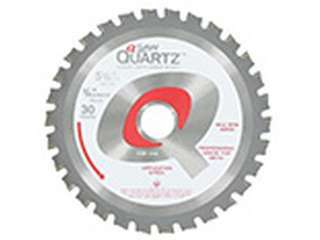 This heavy-duty, non-ferrous metal cutting blade produces an excellent finish. These blades have custom designed gullets to minimize chip build-up and specially formulated carbide for long life. Freud recommends use of a liquid lubricant when cutting. This can be accomplished with a spray of WD-40 or other lubricant every 4 to 5 cuts. Wax sticks are not recommended. 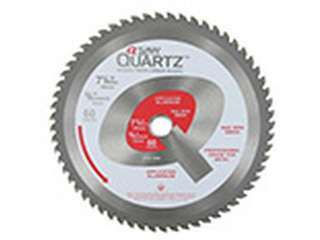 Ideal For: Cutting Thin Aluminum And Other Non-Ferrous Metals. Wall thickness 1/8" Max. This blade produces a smooth, burr-free finish when cutting thin aluminum, brass and other non-ferrous metal extrusions. A high tooth count with a 5° hook angle allows the teeth to slice efficiently through the material without binding. The requirements on the cutting edge greatly differ with nonferrous metals than with cutting wood. 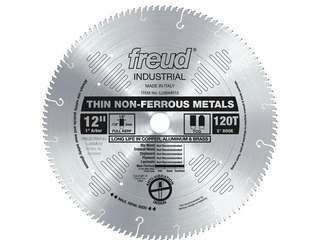 With this in mind, Freud formulated a special carbide with high impact strength for this blade. Freud recommends use of a liquid lubricant when cutting non-ferrous materials. This can be accomplished with a spray of WD-40 or other similar type of lubricant every 4 or 5 cuts. Wax sticks are not recommended. Superior Triple Chip ground teeth excels in a wide range of material such as steel aluminum wood and plastic. Less distortion means truer rotating blade with less wobble producing straighter cuts. It leaves an instantly workable finish, producing no heat, no burr, and virtually no sparks - unlike alternative methods. 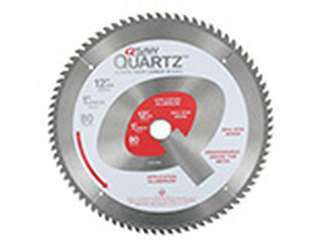 QSaw Industrial Quality Metal Cutting Carbide Circular Saw Blades are available for a variety of applications. Our Carbide blades will make all carbide saws into the ultimate dry cutting machine. QSaw blades are capable of cutting mild steel, stainless steel, aluminum, wood, plastics and a variety of other material leaving a smooth, clean, cool to the touch finish.